This sample resume shows how recent technology graduates can translate their internship experiences into strong material for their resumes. Information technology is a field that has lots of job openings, so how do you get the attention of the top hiring managers? To be considered for the best entry-level IT jobs, you need a comprehensive resume that displays your skills as well as the value you'd bring to a company. 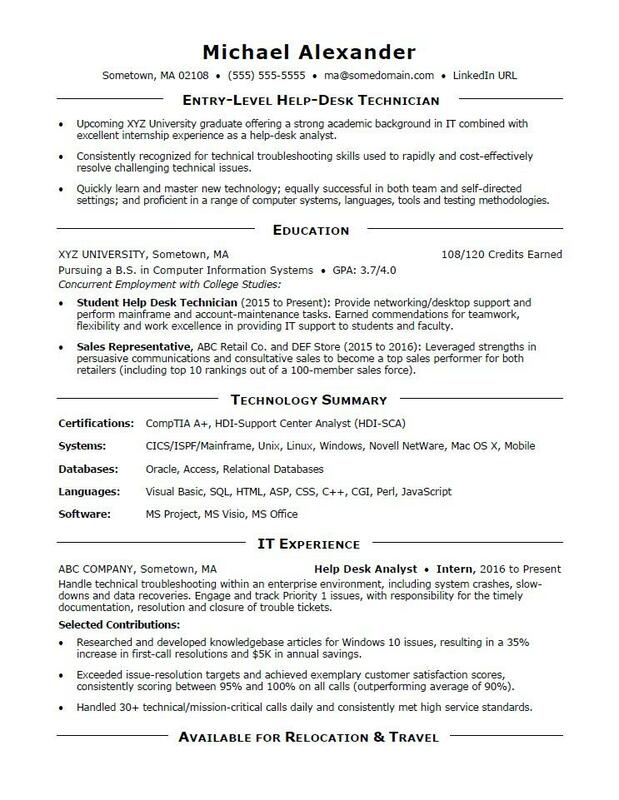 For inspiration, view the sample resume for an entry-level IT worker below, or download the entry-level IT worker resume template in Word. Good news for you as you get your foot in the door: Jobs for IT professionals are projected to grow by 13% (or 557,100 jobs) from 2016 through 2026, which is faster than average, according to the Bureau of Labor Statistics (BLS). You'll find the highest level of employment for this job in the following states: California, Texas, New York, Virginia, and Florida; and in the following metropolitan areas: New York City, Washington D.C., Dallas, Los Angeles, and Chicago. As an IT professional, you can expect to earn a median wage of $84,580 per year (though entry-level salaries are likely to be understandably lower), according to the BLS. Additionally, you can learn more about IT careers or search for IT jobs on Monster. Upcoming XYZ University graduate offering a strong academic background in IT combined with excellent internship experience as a help-desk analyst. Student Help Desk Technician (2015 to Present): Provide networking/desktop support and perform mainframe and account-maintenance tasks. Earned commendations for teamwork, flexibility and work excellence in providing IT support to students and faculty. Sales Representative, ABC Retail Co. and DEF Store (2015 to 2016): Leveraged strengths in persuasive communications and consultative sales to become a top sales performer for both retailers (including top 10 rankings out of a 100-member sales force). Handle technical troubleshooting within an enterprise environment, including system crashes, slow-downs and data recoveries. Engage and track Priority 1 issues, with responsibility for the timely documentation, resolution and closure of trouble tickets. Researched and developed knowledgebase articles for Windows 10 issues, resulting in a 35% increase in first-call resolutions and $5K in annual savings. Exceeded issue-resolution targets and achieved exemplary customer satisfaction scores, consistently scoring between 95% and 100% on all calls (outperforming average of 90%). Handled 30+ technical/mission-critical calls daily and consistently met high service standards. Now that you've written your resume, it's a good idea to have someone critique it before you hit submit. After all, the competition to break into the tech field can be pretty stiff. Get a free resume evaluation today from the experts at Monster's Resume Writing Service. You'll get detailed feedback in two business days, including a review of your resume's appearance and content, and a prediction of a recruiter's first impression.